One could hardly imagine a more perfect environment for Arthur Seigneur to sprout a creative disposition. His father, Jean-Luc, was a master engraver and member of one of the few accredited Grands Ateliers de France, initially doing engraving and embossing work for luxury houses such as Hermès and Louis Vuitton. As a child, Arthur often accompanied his father to work, spending time with artisans in the ateliers. Convinced that he too wanted to work with his hands, at age 16 Seigneur enrolled at the Ecole la Bonne Graine – a furniture school in the 11th arrondissement of Paris, established in 1866 – to study cabinet-making, and specialised in wood veneer and industrial drawing. He later apprenticed to harpsichord maker Reinhard von Nagel and master restorer Michel Germond, then travelled to London, Spain and finally New Orleans, where he discovered marqueterie de paille, or straw marquetry. There is some haziness around the craft’s origins, but it is thought to have been first practised in China, before appearing in Europe. Florentine stone masons in the 17th century produced straw marquetry, as did prisoners of war in the Napoleonic Wars. Though considered the ‘poor cousin’ of wood marquetry, its status changed dramatically during the Art Deco era in France. Championed by decorators Jean- Michel Frank, André Groult and Jean Royère, straw marquetry captivated a new generation of admirers, incorporating the starburst and fan patterns that were emblematic of the age. “They changed the design and made it more for the time. In the 17th century, they did small pieces and tiny boxes, but in the Art Deco period, they went for full walls, whole rooms and mural pieces in straw marquetry,” says Seigneur. The austerity of the post-World War II period, however, saw straw marquetry abandoned once again. That is, until Groult’s granddaughter, Lison de Caunes, began leading a revival 30 years ago – first restoring her grandfather’s work in Paris, and then creating her own furniture pieces and interiors. De Caunes was a family friend, and Seigneur worked alongside her to refine his technique before moving to Australia in 2015. 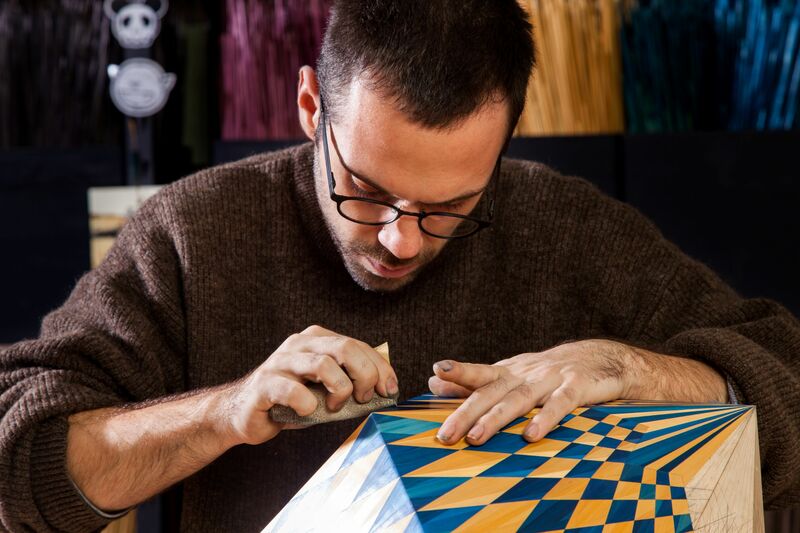 Currently practised by just a handful of professionals in the world (Seigneur believes he’s the only one in Australia), straw marquetry is painstaking work. Seigneur sources his straw dried and dyed in small batches from France. Each stem is opened using a fingernail, then flattened like a ribbon. Straps of straw are then inlaid by hand, glued down, rubbed flat, and cut to the line of the pattern. 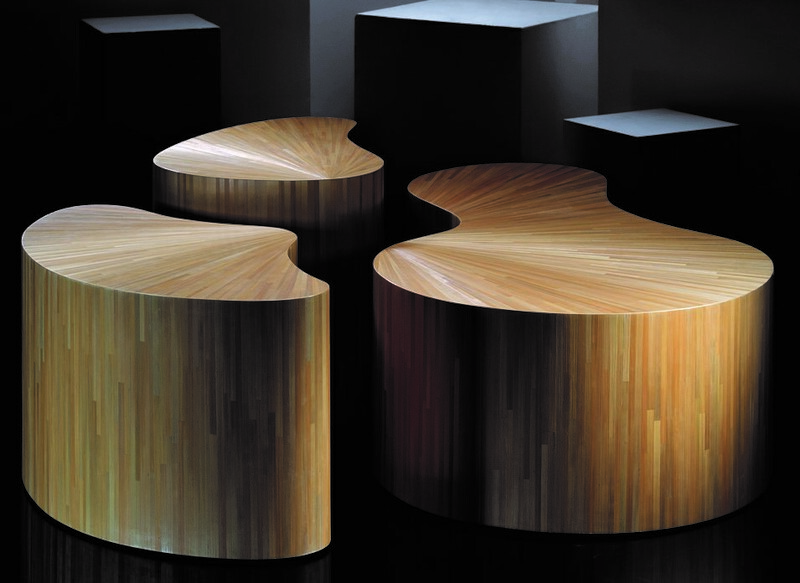 No varnish or lacquer is required to achieve its brilliant finish. “Each individual piece of straw has its own iridescence. Straw has a finish that no lacquer in the world has. When you walk around a sunburst, for example, every single blade of straw shines differently,” Seigneur says. The absence of varnish also makes straw marquetry pieces more durable and easier to repair or restore than wood marquetry; damaged sections can simply be removed and replaced. From his workshop in Sydney’s Alexandria, Seigneur now works on his own designs and collaborations with designers such as Rigg Design Award winner Adam Goodrum, as well as commissions from architects, interior and furniture designers, and private clients for custom furniture pieces. Seigneur has also completed larger interior commissions, such as an apartment door in Paris. He says that three years after its installation, its owners report that they are still more fascinated by the variations in the straw than the television on the facing wall. Against a contemporary design sensibility focused on industrial, hard lines, there is an organic, tactile appeal and a mesmerising sense of movement in straw marquetry.